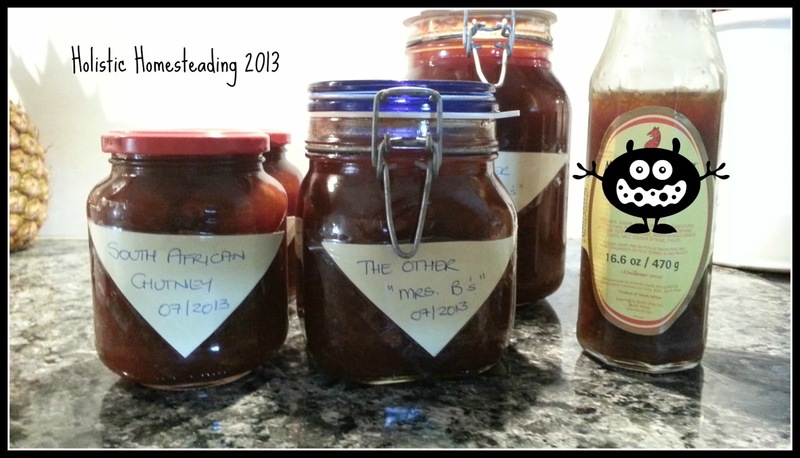 As I am on holiday this week I have decided to keep myself busy by catching up on my preserve making. Today I made some South African Chutney (tastes very close to a well known brand that we all love and cherish by the way!) I think the rest of the world would call it "Relish" or Relish would be the closest thing to Chutney. What I did have a problem with this year was finding dried peaches, but what am I if not the Dehydrator Queen LOL:) So I waited until peaches came on special and grabbed some, dried them and then rehydrated them again - easy! Why bother drying them if I am going to put them back into liquid you ask? It has to do with the final consistency, a dried fruit is a little different to fresh in that it gives the chutney those fruit chunks, which with the fresh fruit would not have been there, then it would have been more jammy. I am not going to share the recipe with you all again today as I did share it as a photo-tutorial last year on Marigolds' Loft. I would love to know if you tried it, and what you think of it. Do you use a kind of chutney with your cuisine?